AEG Lafert motors are available from stock ready for next working day delivery. Single phase motors are available in both permanent capacitor and capacitor start - capacitor run models. 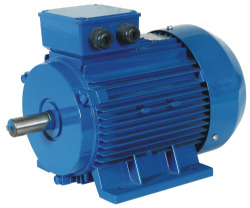 Three phase IE1 standard efficiency motors available from 0.06kW to 0.55kW. For higher rated power motors from 0.75kW to 200kW please refer to AEG Lafert IE3 high efficiency category. For any further information regarding this range of products please do not hesitate to contact us on 01233 878024.